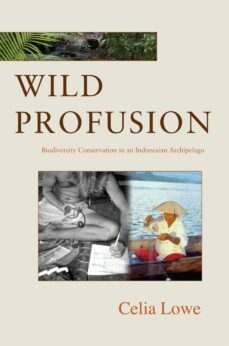 Wild Profusion tells the fascinating story of biodiversity conservation in Indonesia in the decade culminating in the great fires of 1997-98--a time when the countrys environment became a point of concern for social and environmental activists, scientists, and the many fishermen and farmers nationwide who suffered from degraded environments and faced accusations that they were destroying nature. Celia Lowe argues that biodiversity, in 1990s Indonesia, implied a particular convergence of nature, nation, science, and identity that made Indonesians mapping of the concept distinct within transnational practices of nature conservation at the time.Lowe recounts the efforts of Indonesian biologists to document the species of the Togean Islands, to "develop" Togean people, and to turn this archipelago off the coast of Sulawesi into a national park. Indonesian scientists aspired to a conservation biology that was both internationally recognizable and politically effective in the Indonesian context. Simultaneously, Lowe describes the experiences of Togean Sama people who had their own understandings of nature and nation. To place Sama and scientist into the same conceptual frame, Lowe studies Sama ideas in the context of transnational thought rather than local knowledge.In tracking the practice of conservation biology in a postcolonial setting, Wild Profusion explores what in nature can count as important and for whom.